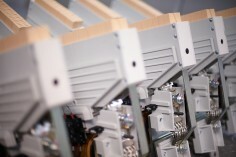 The Knorr-Bremse subsidiary, Microelettrica Scientifica (MS), produces AC&DC contactors and disconnectors, resistors and electronic devices for both industrial and railway applications. The products for the railway market include the following features. Four ranges of contactors and disconnectors operating up to 4 kV, for loads from 50 to 2000 A per pole. Resistors include brake, damping, snubber, filter, charging and discharging resistors. Electronic products are high voltage transducers for line voltage and current measurement and energy metering function, to be used both on board of vehicles and in DC substations.